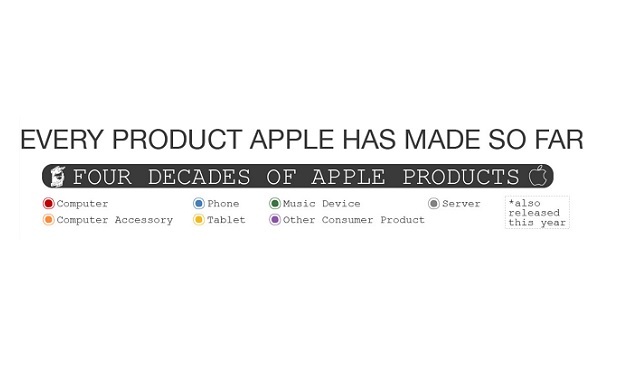 Every Product Apple Has Made So Far #infographic ~ Visualistan '+g+"
Apple is one of the biggest tech giants worldwide, and this infographic from TitleMax looks at every product the company has made so far, dating all the way back to 1976. This timeline from TitleMax shows just how much Apple has innovated and changed the core of the tech industry in only a little over four decades. It's incredible to think that the "Macintosh Portable" retailed for over $7,000 in 1989 (the equivalent of over $14,000 in 2018 dollars). Today, something that can do everything the Macintosh Portable could do and much, much more (such as the iPhone or MacBook) costs only a tiny fraction of that price. And such is the power of advancing technology. The more technology advances, the cheaper it becomes to produce. Apple was founded on April 1, 1976 by Steve Wozniak and Steve Jobs, who were famous for their computer wizardry and marketing skills respectively. After releasing the Apple I in 1976, it's been more than 40 years of the company releasing products that have changed the world for the better!